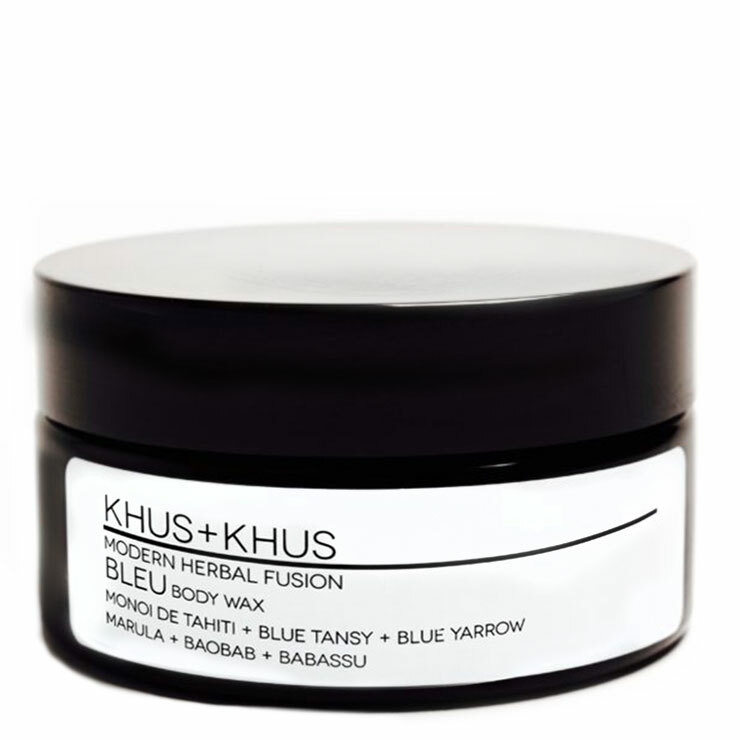 Exotic Babassu, Baobab, and Marula oils combine in Bleu Body Wax by KHUS+KHUS to create a feeling of deep, lasting nourishment and hydration. 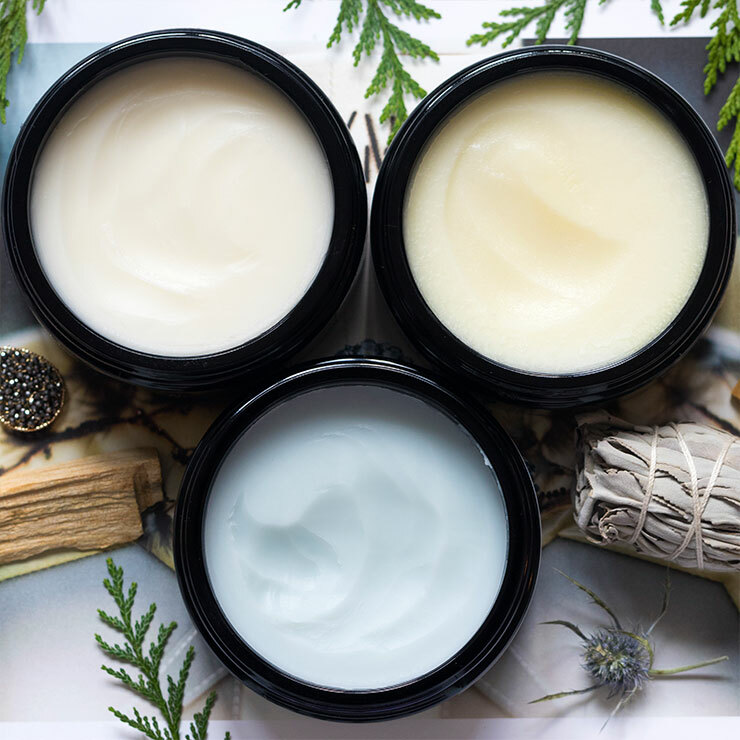 Blue Tansy offers a sense of relief to sore muscles and discomfort, while Blue Yarrow lends a soothing feel to irritation and inflammation, perfect for use on sensitive skin. An intoxicating scent of Monoi de Tahiti infuses this body moisturizer with a luscious aroma and inspires a sense of calm. Enjoy KHUS KHUS Body was as a part of a daily Abhyanga, self-massage ritual after shower or bathing. Massage onto skin in long strokes, working toward the heart for a stimulating feel. May be reapplied throughout the day for an intoxicating scent. 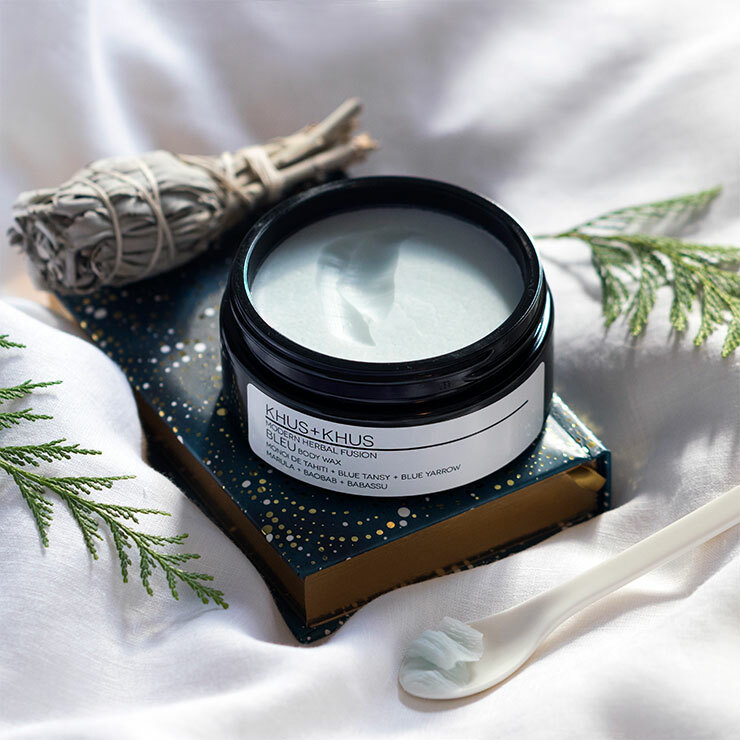 There is nothing waxy about this luxurious body moisturizer! 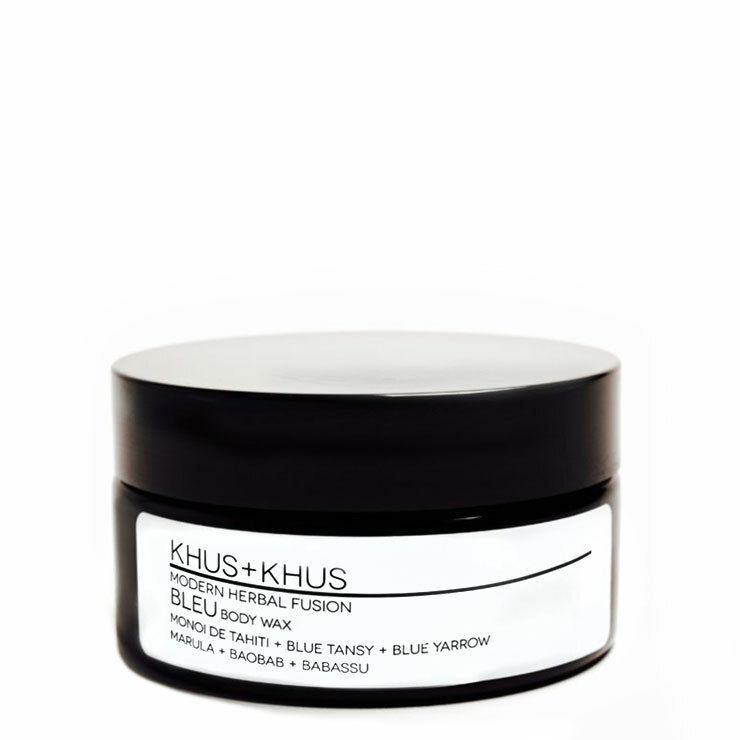 It's a tub of pure joy that has a heavenly, sweet-herbal fragrance and melts into the skin upon application. Though I used a butter knife to extract it at first, I had no trouble smoothing it all over my limbs, and a little bit goes a long way. I used an average of five days a week, and the jar lasted two months. It's more absorbent than traditional body oils or butters and did not leave my skin feeling greasy or sticky after applying. I will consider buying this again. Body wax? It melts instantly when rubbed between your palms and then applies to the skin like a body oil. Very nice. Herbal scent is pleasant. I am not thrilled with shea butter body creams because they are so heavy and sticky. This is a great alternative. It doesn't get on my pajamas and by morning it is not oil, but feels just slightly waxy. Long-lasting moisture for the body. I enjoyed this product. Melts into the skin nicely to soften. My only gripe is that in hot weather it does liquify and will make a mess when you open the jar. I was not thrilled about the idea of a "body wax" when I got this. But it was not sticky, or too thick, or tacky as I worried. It melts easily with body heat. The scent is unusual but relaxing. And the nicest part is how beautifully it absorbs into the skin. This has replaced the lotions and oils I used to keep for massages. 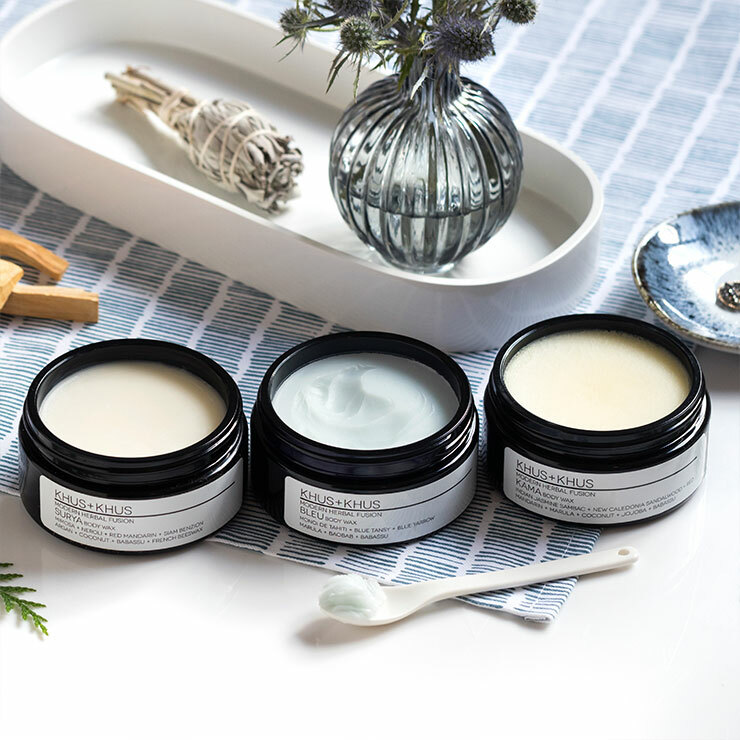 It never feels cold when it goes on the skin, the way lotions often do. I've never experienced something like this before! This has a deeply intoxicating tropical floral note, and the texture of the wax is very soft and pliable. My skin has also never felt so protected! LOVE!